We used an old camper stove to melt the used candle wax we brought. We did this in the garage for ventilation. 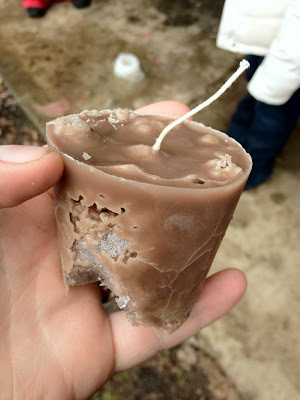 It was fun to recycle our old candles in this way. The weather, however, was odd… We hardly felt the chill in the afternoon. Unusual for Imbolc in upstate NY. We did have *some* snow. Very little, but enough to help quicken the solidification of the candle wax as we took turns pouring it into the molds. One would become an offering to Brighid during our rite. The other is to be a candle we light throughout the year when we invoke the bardic deity in rituals. 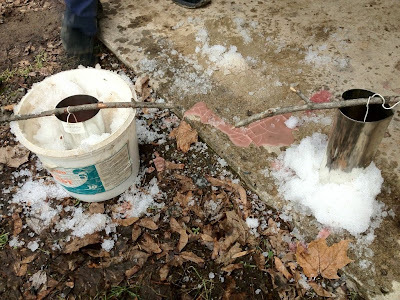 In addition to the larger candles we made, we also used some of the extra wax to create “ice candles” using the snow. We used paper cups coated in wax as molds. Here’s the one Weretoad made. We all had difficulty creating smooth bottoms, but it was a fun learning experiencing! The ritual itself was wonderful. Our Imbolc rites are usually quite poignant for me. To begin with, Brighid is my patroness and I have a good relationship with her. Second, gathering around the fire on such a cold night… It feels very intimate. We appreciate the flame more and truly open up to Brighid’s power. 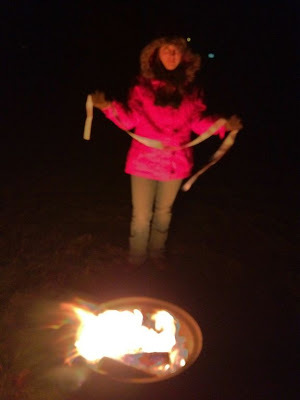 Here’s a blurry photo of me by the flames while holding my brat Bríde after the rite. We placed our fabric on fences and pallets as we worshipped so they would absorb Brighid’s blessings – especially her healing power.